Developing and launching new products, as well as expanding commercial operations, are the priorities identified by 10x Genomics for how it will use the proceeds of a combined $125 million in new funding. The capital—consisting of a $50 million Series D financing and a $75 million debt financing—comes more than three months after privately-held 10x Genomics disclosed at the JP Morgan 36th Annual Healthcare Conference that it finished last year with $71 million in revenue, more than 150% above the $28 million generated in 2016. 10x Genomics placed ninth among “Top 10 Sequencing Companies” ranked earlier this month by Genetic Engineering & Biotechnology News, a sister publication of Clinical OMICs. 10x Genomics also disclosed that it had generated more than $100 million in the 30 months since commercially launching the first of its 25 products, spanning instruments, reagents, and software. This year, 10x Genomics said, its plans include launching new products that include single cell multi-omic measurements of proteins and gene expression, single cell epigenomic analysis—and single-cell DNA sequencing for oncology. 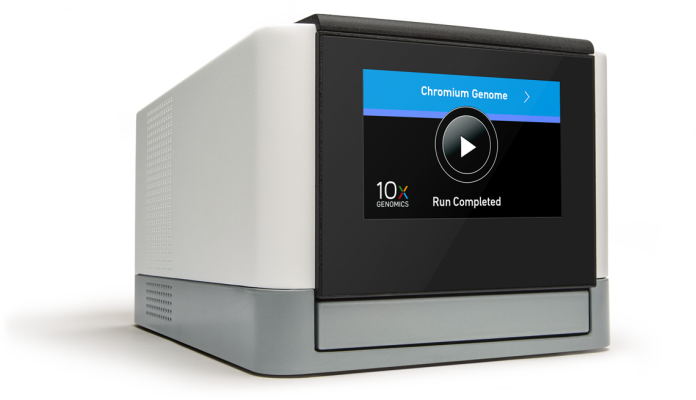 The company has begun accepting pre-orders for its Chromium Single Cell CNV Solution, which according to the company is the first scalable and easy-to-use technology for rapid and massively parallel profiling of single cell genomes, with anticipated delivery beginning in July 2018. 10x Genomics launched the single cell solution on April 13 at the annual meeting of the American Association for Cancer Research in Chicago on April 13. The Chromium Single Cell CNV Solution is based on technology designed to generate Cell Beads and Gel Beads (CBGBs), unveiled during the Advances in Genome Biology and Technology Meeting (AGBT) in February 2018. All of the company's new products are designed for its Chromium Controller, which was announced at AGBT in 2016. Since then, more than 600 Chromium Controllers have been installed worldwide, according to the company. 10x Genomics said its plans include expanding its internal manufacturing capabilities, as well as opening new offices in Shanghai and Leiden, the Netherlands, as part of an expanded global commercial organization. 10x Genomics accessed the $75 million debt facility through Silicon Valley Bank. The $50 million Series D financing was led by Meritech Capital Partners, with participation by new investor Wells Fargo Strategic Capital along with current investors Paladin Capital, Fidelity and the SoftBank Group.